1,794 people read this post. In the hadith of Jibreel (Alayhis-Salaam), when he came to the Prophet (Sallallahu Alayhi Wasallam) and asked him about Islam, Eeman, and Ihasan, the Prophet (Sallallahu Alayhi Wasallam) said about Eeman, “Eeman is to believe in Allah, His angels, His books, His Messengers, the Final Day, and the divine decree, the good and the bad thereof.” For the past few weeks we have been reflecting on this hadith, only glimpses. Today we shall conclude with the last article of Eeman: to believe in the Divine decree, the good and the bad thereof. Al-Hasan ibn Arafah started weeping when he heard what had happened. Imam Ahmad questioned him, “Why are you crying? I did not lose my Eeman. After that why should I care if I lose my life?” They were better than us but this was how they were tested. 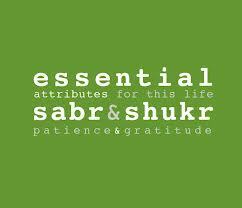 Sabr in the obedience of allah. For example, one must be patient and perform their Fajr at it’s time. Sabr in not disobeying Allah. Like someone might say, “I just have to insult him.” No, we are commanded by He Who gave us our tongues to not follow the whispers of Shaytaan. And we must have Sabr in not disobeying Allah. The First Key: know that our souls, families and wealth do not belong to us, they belong to Allah. He gave it to us as a loan to see what we would do with it. And when He takes it back He is taking back what belongs to Him. We had nothing before the blessing and we’ll have nothing after it. We did not create the blessing from nothing, so how can we claim that it belongs to us? The Second Key: We are on a journey and the destination is the hereafter – Paradise or Hell. We shall be leaving the Dunya behind us and we’ll come back to Allah by ourselves. This is what needs our focus. And if Allah is pleased with us then no worry. If He is not pleased with us then all worry. The Ulama’ have suggested, Wa Allaahu a’lam, that in the hard times that a person goes through (especially in a divorce) they should not forget the remembrance of Allah, the Salah. And it is that Salah coupled with Sabr that will pull them through. Allah promised anyone who wants to work on his or her patience three things: Forgiveness, mercy, and guidance. Who could ask for more? Previous KFC or kari kitchri ?